a-ha are ending things on a high note – having received recognition from elite bands like U2, Coldplay and Oasis. Today marks the start of the world tour which will end with two concerts in Oslo in December 2010. And when a-ha say that this is the end, they really mean it. “a-ha will never return after 4 December 2010. There will be no more album releases or concerts”, Magne Furuholmen says. Dagbladet is talking to Furuholmen on the phone from Cologne. It’s a joyful, satisfied and talkative pop star on the other end of the line. “We’re ending things on a high note”, Furuholmen says. 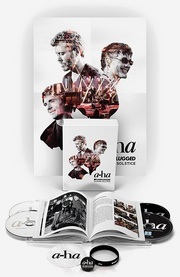 Furuholmen can promise a big and spectacular ending to a 25 year long adventure, and tells us that the audience will get to experience a version of a-ha that we have never seen before. a-ha is the only Norwegian band – measured by success and quality – that is part of the pop world’s Champions League. “People at home [in Norway] have become very fond of us. Everyone want us to be successfull, and we feel a bit like the national football team – everyone are cheering for us”, Furuholmen says. But it hasn’t always been like that. It’s only in later years that the band has been given the recognition they deserve. That’s also true abroad. The international press and other band colleagues respect the trio for their longevity and for the way they shaped the pop sound of the 80s. It was in connection with the controversy surrounding U2’s “Beautiful Day”, which was seen as plagiarism of a-ha by many, that Bono and company gave their comments. “We are all magpies, who steal and borrow from each other. But it was nice to get some feedback from U2”, Furuholmen says. Coldplay said early on that they were a-ha fans. This lead to Chris Martin and Furuholmen becoming close friends. 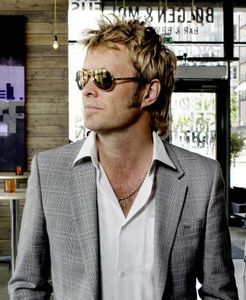 “When people use a term like “a cross between a-ha and Talking Heads” to describe a genre, then you’ve made an impression”, Furuholmen says. Even though a-ha will split up next year, Morten Harket, Magne Furuholmen and Paul Waaktaar-Savoy will continue as musicians – individually. Furuholmen will also continue with his art projects. This article appeared in Dagbladet, 27 October 2009.